The following video was taken to help understand the firmware installation. I installed several LCDs in my uBITX and uploaded all the .Hex files in sequence. 1.More information on various LCD support is available at the link below. 2.More information about Extended Key can be found at the link below. Version 1.073 Beta A little bit changed in the above post just before the release. The above post supports only 4 function buttons. 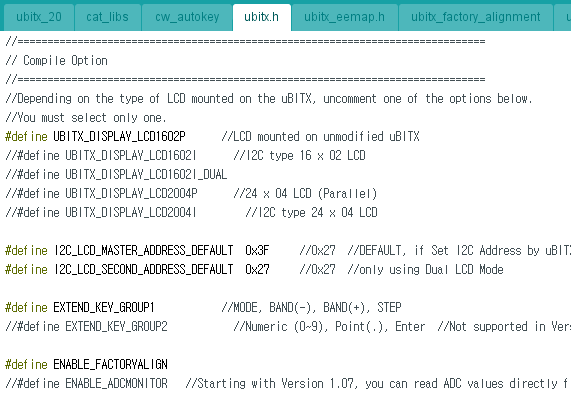 However, you downloaded Version 1.073 and uBITX Manager 1.04, you can select the function for the button. I will post relevant videos or usage within a short time. - Added section for setting Extended Key. After all settings are completed, press 'Reset' button and uBITX will reboot and apply the settings. Beginning with Version 1.073, you must select the compile option. 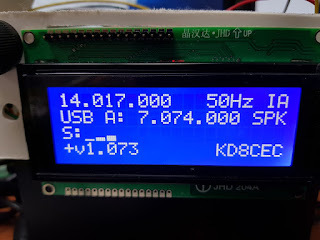 You can modify the compilation options to suit your LCD type. 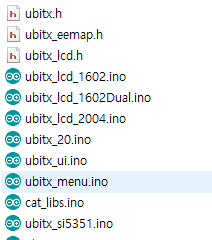 You can find compile options in the ubitx.h file. If you are using the LCD at the time of uBITX purchase, please correct it as follows. If you are using an LCD other than the default LCD, you can erase the comment mark on the front of the LCD. Below is an example of using a 20x04 I2C LCD. CEC Firmware has added ADC monitoring functionality to the CAT protocol since Version 1.070. 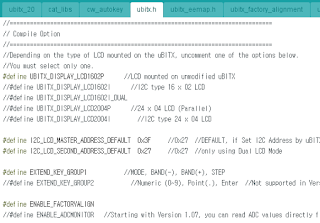 If ADC monitoring is needed to reduce CW-Key error, uBITX Manager can read ADC values connected to uBITX. So I removed the ADC monitoring function in uBITX since version 1.073. However, if you need ADC monitoring for other reasons, you can enable the ADC monitoring menu as shown below. Maybe you need more free space than you need to add your firmware. If so, disable both Factory Align and ADC Monitor as shown below. If you need more space and do not need the Extended Key function added in Version 1.073, disable it as follows. Perhaps you will be ensuring a space close to 10%. I am looking for instructions on using Memory Manager. Also, Please change in ubitx_20.ino: delay(5000) (was 500) 500 msec is too short to read version display.